In their aim to make banks safer, prudential regulators have tried to link capital requirements to risk. The first Basel agreement (1988) introduced simple risk metrics known as ‘risk weights’, which determine the capital requirement associated with a given asset, and are meant to quantify its relative riskiness. To relate capital more closely to banks’ own risk estimates, the Basel II agreement (2004) allowed banks to use their internal risk models to set risk weights (under the ‘internal-ratings based’, or IRB approach). These models are costly to set up and manage, and while most larger banks have adopted them, smaller banks tend to rely on a simpler schedule of risk weights set by regulators – the ‘standardised approach’ (SA). 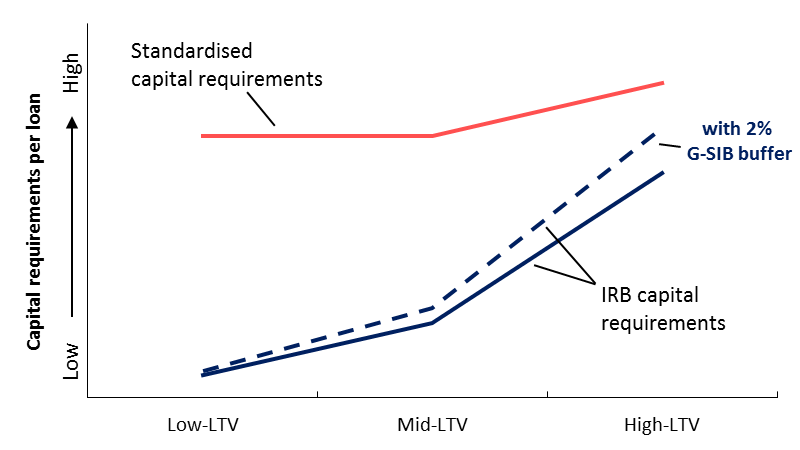 Figure 1 plots risk weights against loan-to-value (LTV) ratios – a key proxy for credit risk in the UK – for both the IRB and SA approaches. 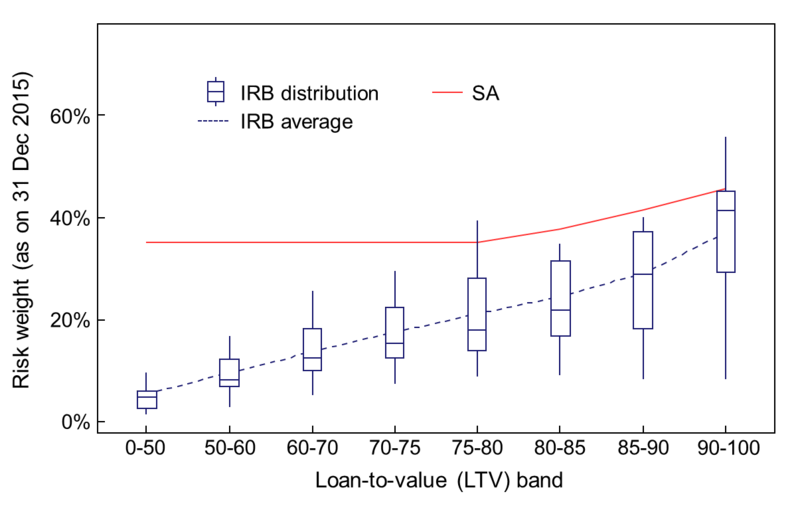 Risk weights under the IRB approach (dashed blue line) are lower than the SA approach (solid red line), and the gap is particularly pronounced for low LTVs. Source: Bank calculations. The blue box-and-whisker plots show the median, quartiles, and range of IRB risk weights. A few outliers have been removed to preserve data anonymity. So Basel II gave large firms a comparative advantage in lower risk mortgages – and they’ve since taken advantage of it. In turn, smaller firms have increased the proportion of higher risk mortgages that they write. This issue represents a classic example of unintended consequences from regulation. It also ties into international policy negotiations surrounding the final implementation of Basel III. Well before Basel II was implemented, economists predicted that the IRB-SA gap in risk weights would lead firms to specialise. It’s no secret that firms prefer to economise on capital, so if IRB firms get a capital discount on their low-LTV lending, it makes sense that they would prioritise this market segment. Now, eight years after the policy’s introduction, we’ve been able to take the theory to the data and check that this prediction has been borne out. To do this, we constructed a unique dataset covering 7 million mortgages in the UK, including within-firm variation in mortgage interest rates and in the associated capital requirements. So what do these data tell us? Figure 2 shows that changes in risk weights for the two groups of firms were mirrored in their mortgage rates. Source: FCA Product Sales Database and Bank calculations. Benchmark rate based on sterling interbank rates (LIBOR) and on yields on instruments linked to LIBOR, short sterling futures, forward rate agreements and LIBOR-based interest rate swaps. 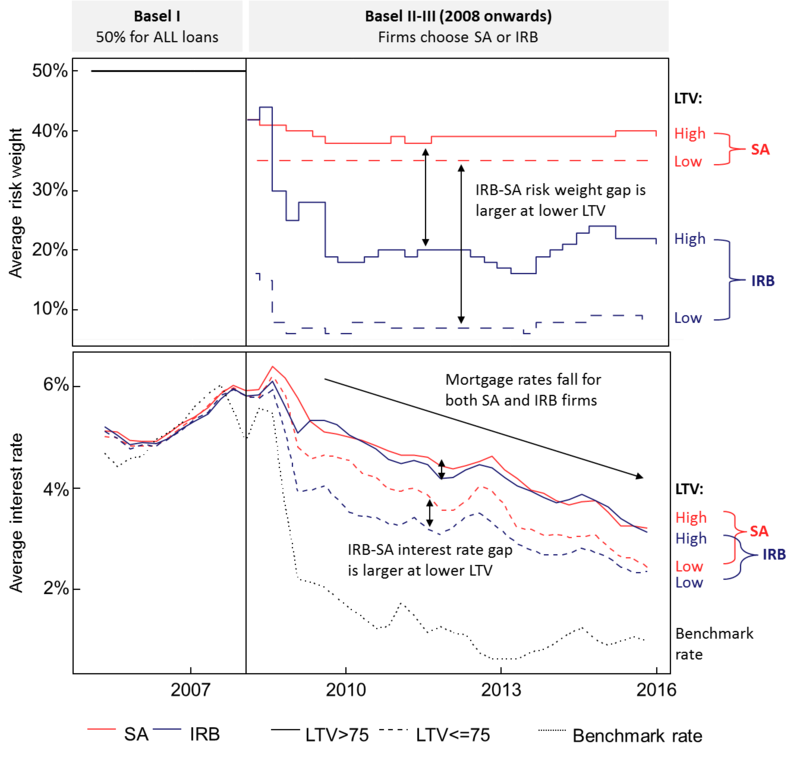 The top panel shows how the gap in risk weights emerged after the introduction of Basel II in 2008. 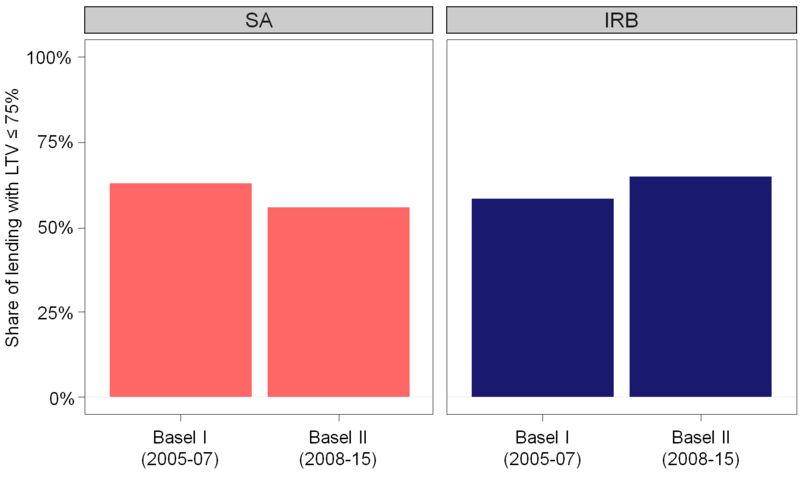 SA risk weights are shown in red, while IRB risk weights are in blue. Solid lines represent high-LTV lending, while dashed lines indicate low-LTV lending. Risk weights on all mortgages fell compared to Basel I, but IRB risk weights fell further than SA risk weights, and the gap was larger at low LTV ratios. The bottom panel shows how a similar pattern emerged in the interest rates charged to borrowers. Rates remained close among high-LTV mortgages, but IRB firms began to substantially under-price their smaller rivals in the low-LTV market segment. In our paper, we show this more formally, using two complementary approaches (briefly, these are: (1) a triple-difference regression estimator that exploits the quasi-experimental variation accompanying the regime change in 2008, and (2) a panel regression including pairwise-interacted fixed effects which uses variability in IRB risk weights post-2008 to assess the effects of more granular changes to risk weights). The data imply that risk weight changes under the introduction of Basel II (as seen in Figure 2) caused changes in lenders’ interest rates, and specialisation in their portfolio shares of high- and low-LTV lending. Figure 3 illustrates the difference in average portfolio shares: a relative shift of 12 percentage points between the two periods. Source: FCA Product Sales Database and Bank calculations. For interest rates, we estimate that a 1 percentage point change in risk weight leads to a 1 basis point change in mortgage rate. Given the size of the risk weight gap at low LTV (about 30 percentage points), this means an average price advantage of 30 basis points for IRB firms. In an environment of ultra-low interest rates, this is substantial: a price difference of this magnitude will lead some borrowers to prefer the cheaper lender, particularly if they’re using price comparison websites. 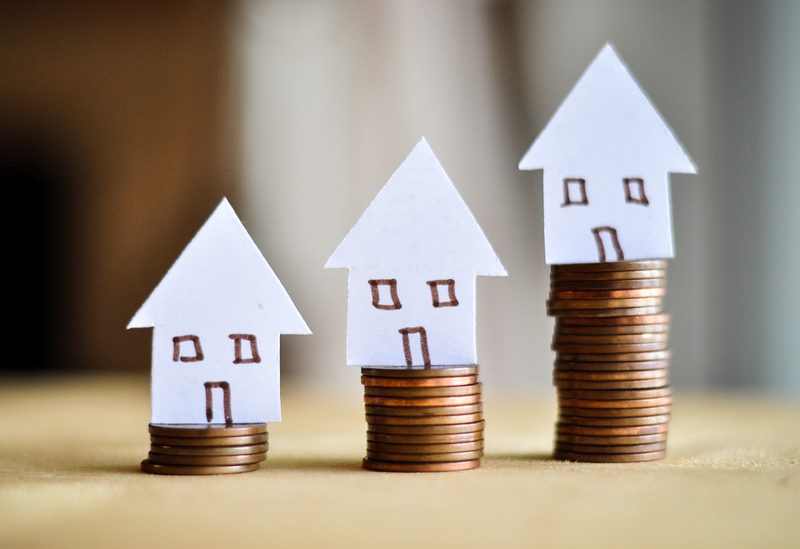 In a recent ‘best buy’ table compiled by Moneyfacts (search performed 15 November 2016), the gap between rates offered by the top- and tenth-ranked mortgages was only 17 basis points. Moreover, given the size and length of mortgages, a few basis points can add up to a meaningful amount of money. On an average UK mortgage, a 30-basis-point interest rate spread results in roughly £170 more interest charged per year over the life of the loan. These results imply that differences in risk weight methodologies between banks can affect the balance and pricing of mortgage types offered by those banks. Financial stability is also affected, because the distribution of risk across lenders can affect the resilience of the financial sector. Basel II led to smaller standardised banks taking on a higher share of high-LTV lending. These banks have lower systemic importance than their larger counterparts, so the risks arising from failure may be less acute. However, they could be considered more vulnerable in the sense that their risk management may be relatively less sophisticated. Any macroprudential tool that increases firm-level capital requirement ratios (such as G-SIB buffers for large banks, or the countercyclical capital buffer) will amplify the differences between assets with different risk weights (and vice versa for decreases). This is illustrated in Figure 4 for a hypothetical G-SIB buffer of 2%. And to the extent that IRB risk weights are procyclical, this could lead to procyclicality in specialisation. Notes: illustration only. Capital requirements are the product of assets, risk weights, and the overall firm-level capital requirement. G-SIB buffers are likely to apply only to IRB firms, and will add a few percentage points to firm-level capital requirements. How could policymakers respond? Two options are to revise the standardised approach to make it more risk sensitive, or put a floor under the risk weights available under the IRB approach. Making the two curves in Figure 1 parallel would remove the incentives for specialisation. Final adjustments to Basel III will be made following international meetings in 2017, so we may see this issue discussed or addressed at that time. For those interested, there’s much more detail in the paper. Matteo Benetton is a PhD student at the London School of Economics, Peter Eckley works in the Policy Strategy and Implementation Division at the Bank of England, Nicola Garbarino works in the Policy Strategy and Implementation Division at the Bank of England, Liam Kirwin works in the Policy Strategy and Implementation Division at the Bank of England and Georgia Latsi is an analyst at 4-most Europe. Perhaps it would be appropriate to add an analysis of LTV volatility AFTER writing the mortgages and the behavior of regulators on the resulting situations.